Today I want to share with you my research and deliberations about the purchase of a new sewing machine. I am about to buy a new sewing machine as the old one I have is just not up to the job of stitching large amounts of fabric together. On top of that I would like to increase my Quilt output somewhat by machine quilting smaller quilts. The Pfaff is the least expensive of all with GBP 1155 followed by the Bernina with GBP 1395 and then by the Janome with GBP 1795. 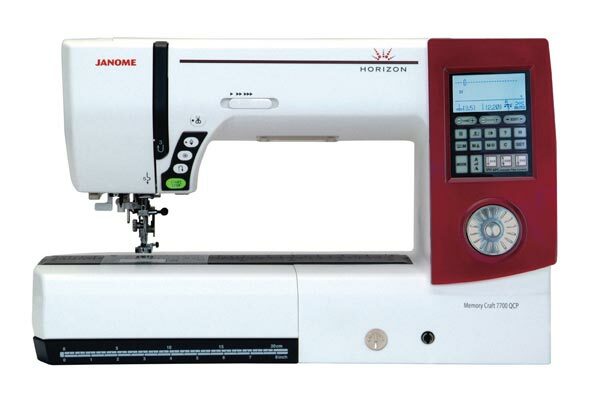 But the Janome is reduced to GBP 1295 if one hands in an old machine (or any old piece for that matter). I now have spent weeks on the net researching all three. At the beginning I favored the Pfaff simply because my mother has had one for 40 years now and it still works and I suppose because it is German (as I am German...) but then I found all over the net the most horrible reviews of the machine. An excellent review thread can be found here. A lot of people had problem with he machine eating fabric and giving all sorts of incorrect warnings and errors. I found this really disappointing as I loved the fact that it has a long arm and that was one of the most important feature sfor me. 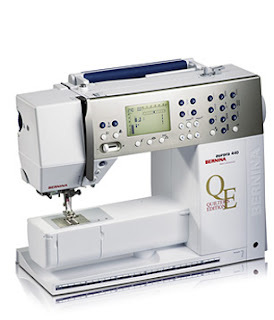 So I went to Direct Sewing Machines in Battersea and had a look at the Pfaff and Bernina. Chris from Direct Sewing Machines is very helpful and most knowledgeable and explained the machines to me. I had a go at the Bernina and found it to be a very accurate machine but also very small with a particular short arm. Chris assured me that it is the best machine on the market and that it has the advantage of still being a bottom loader rather than a top loader. Pfaff also used to be bottom loaders but changed recently to top loaders and he thinks that the quality hasn't been the same since. I also read in several reviews that the production of the machines has been moved out of Germany and that quality has thus suffered. If one spends that amount of money one has to be sure of the purchase and at this point I wasn't at all. I didn't want to risk the Pfaff with all its teething problems nor did I want to have the small Bernina albeit it being the superiour machine. So I went home thinking and thinking and a bit more of that. 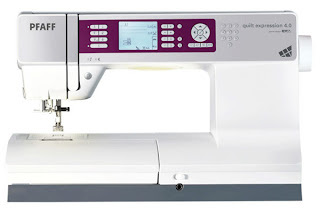 Then I remembered that a fellow quilter in the summer told me about the new Janome 7700. I asked in my local quilt shop what the feedback on the machine was and it seemed to be entirely positive so are the reviews on the net. This is a fairly big machine and weights about 13 kg but it is not to big to handle and it has the much desired long arm plus all stitch variations one can think about. It is a top loader but Chris from Direct Sewing Machines assured me that Janome are the best company when it comes to top loaders. It has a hefty price tag of GBP 1800 but with the part exchange offer it is a more "manageable" price. Does anyone have any experience on the above machines ? P.S I have meanwhile bought the Janome and posted a review here. I have just bought myself the Bernina, and really like it. Have you thought about a Juki though? It's a semi professional machine, so it should be tougher than a domestic machine. Amanda from the blog Crazy Mom Quilts has one, she produces loads of quilts and really loves it. I would have looked at it when I chose my machine, but they're a little more difficult to find in Australia , and I liked the compactness of the Bernina. I'll be very interested to see which machine you finally decide to buy Judith as I, like you have been looking/comparing these exact same three machines :-) at the mo i have a janome but it's a very basic machine (although I have invested in a walking foot & a free motion foot for it)......I lean toward getting a Bernina as they are so popular amongst 'quilters' (like you I am a newbie quilter) but I really like my little Janome.......what to do eh?! the horizon is brand new so reviews are really only just starting to come out about it... i have had loads of problems with mine and trying desperately to get a refund... i could not recommend this machine to anyone... i think being a new machine it has a LOT of bugs to be sorted out... i would advise you to wait until the bugs are sorted before buying! I'm afraid I can't offer an first hand advice, but talking to people Janome is the one to go for. I recently attended a class and it was the girls with the bernina's that were having the most trouble, particularly stitching through several thicknesses. Happy Shopping! You are looking at exactly the same 3 machines I considered. The Bernina is a sophisticated looking machine, but way too cramped and not 'the wave of the future' for todays techniques. Amazingly-- their 820/830 models have given folks a lot of head ache! It isn't realistic to compare todays brand names with what our mother's had, because so many of these companies have changed hands and begun sharing technology over the last 15 years anyway. I have a Horizon on Layaway-- the only two negatives I've read on it are that it had trouble transitioning from thin to thick with the 1/4 in foot. So...Janome made a new 1/4 in foot and sent it out to all buyers. The other thing I heard is, the rear feed dogs may need an adjustment, but this is supposed to be a very simple easy adjustment. Nothing major. Quilt blogger Leah Day is using the Horizon with beautiful results. Amazingly, she states...she hasn't read the manual. Who buys a 3,000 machine and doesn't read the manual??? The point is-- pack up some supplies for scenarios of what you sew and take them to a Janome dealer. Test the machine according to how you would use it-- with your own stuff. Then decide. I have already discussed with my dealer that when I come to pay off my machine so I can take it home, we will take it out of the box and I will have my free 'familiarization lesson' right then-- before it comes home. This way if it does require a feed dog adjustment-- we can do that right then and there. But honestly, I really don't expect any problems. It's a beautiful machine, very quiet too!